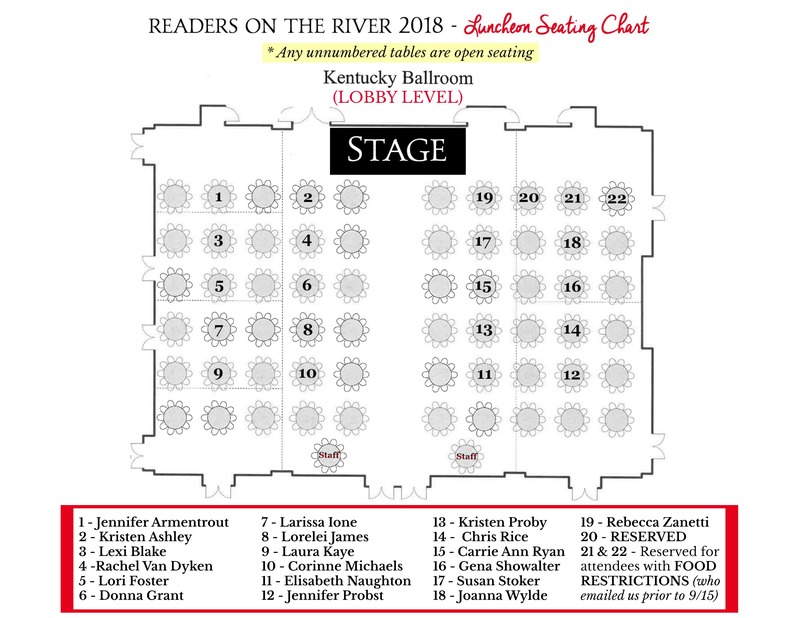 Can you believe we are less than two weeks away from Readers on the River 2018? As the ROR team is putting the final touches on all the prep work for our event, we wanted to pass along some important event information for all of our attendees! Sparkler event featuring the 1,001 Dark Nights authors. This is an event that 1001 Dark Nights has become known for – and it’s super fun. Each attendee will receive either champagne or a non-alcoholic option, and be given a fun questionnaire listing one question and all of the author names. The goal is to visit each author and write down their answer to your question. After the event, we’ll draw one winner who’ll receive a $100 Visa gift card. The questions are ice-breakers – and the goal is for each attendee to get a little time with each author – in a fun and interactive way! NOTE: Champagne will only be served to attendees 21 and older; a non-alcoholic option will be available for those under age/who prefers it. Coffee & Souvenir Cookie social for attendees to kick off the day! Four panels featuring the 1,001 Dark Nights authors & special guests — for panel info, go here. A reader Q&A session with author J.R. Ward + plated luncheon for attendees! *All authors will be in attendance for this event, and attendees who won lottery table seating spots have been notified. After party event featuring an 80’s cover band, photo booth, and more! *There is no “dress code”; you can come dressed in 80’s garb, or come as you are. We want everyone comfortable and ready to have a good time! J.R. Ward will be interviewed by Christopher Rice. J.R. Ward will take fan questions during this event. J.R. Ward will be present for the entire signing session. Her line will be ticketed (aka, numbered wristband). Every ticket holder will be entitled to ONE wristband = ONE line visit. There is a 5 book limit per line visit. We can only guarantee time will permit one line visit per person, so plan accordingly. NOTE: Copies of CONSUMED do not count toward your 5 book limit. IN EXCITING NEWS: J.R. Ward is happy to take photos with any of you who’d like to do so. Just have your camera ready and our staff will take the picture. J.R. Ward is also planning to attend the Saturday night party – she loves the band! – But she doesn’t want to promise that in case the signing runs super long and she’s exhausted, etc. Our registration stations will be located on the second floor Ballroom level (directly above the lobby level), and is accessible by both escalator, and elevator. We will have 4 tables divided by last name (listed on your registration): A-F, G-M, N-T, and U-Z. You will need to show your picture ID when checking in at ROR registration. Please make sure the name on your ID matches the name on your Eventbrite ticket. Note: If your name is under a friend’s name, your friend will be able to check in all of the tickets associated with their name. 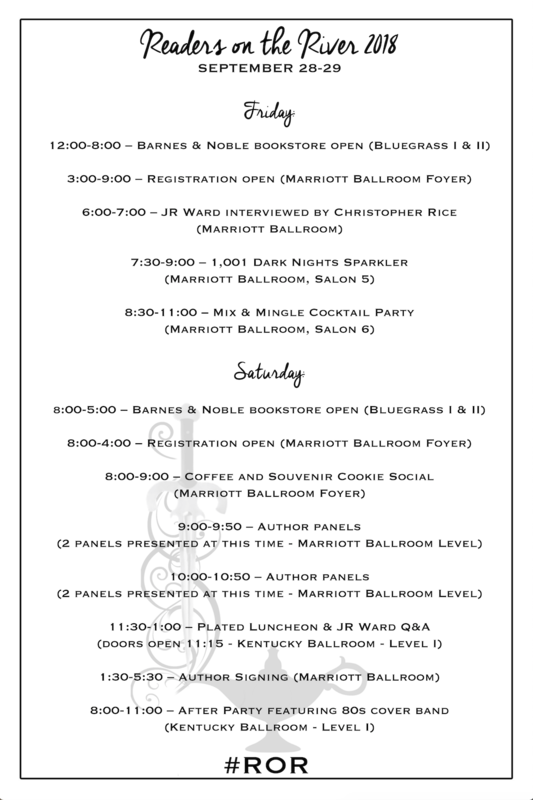 When you check in at registration, you will receive your Attendee badge, event swag bag, and will be able to pick up numbered wristbands for any pre-ticketed authors (listed in the section below). NOTE: Each attendee will be able to pick up ONE numbered wristband per pre-ticketed author. IF YOU WON A SEAT FOR THE TABLE LOTTERY (Saturday Plated Luncheon): You will also need to “check in” at the table lottery station by giving your name and author table assignment so we can confirm your spot. ICYMI: Last month we polled ticket holders in order to get a better idea of which authors would likely need line support during the signing event. Based on this poll, we’re opting to release numbered line control wristbands prior to the signing in effort to have the process run smoother the day of. Keep in mind that event staff will be closely monitoring lines during the signing, and will be prepared to begin distributing numbered wristbands within the signing room for any lines that may be getting too long. This will also ensure that attendees won’t need to spend long periods of time stuck in one line, and gives you more time to visit other authors while you wait! We will have a staff member calling out numbers (via the PA system) during the signing so that attendees know when it is time for them to line up. *As listed above, each attendee will be entitled to ONE wristband per author. Attendees will not be able to return to ticketed lines until all wristbands have been serviced. Our onsite bookseller will be Barnes & Noble! The bookstore will be located on the Ballroom level, which is the level directly above the lobby. We will have early copies of CONSUMED by J.R. Ward as a ROR event exclusive! CONSUMED will be available for purchase while supplies last. There will be titles by each of our authors in our lineup. There will also be current 1,001 Dark Nights titles written by the authors in the lineup available! Cash and major credit cards will be accepted. You will be able to pick up your preordered titles all at one time in the bookstore during their hours of operation. Please make sure to have your photo ID that matches the name on your order/payment. If you’re picking up an order for a friend, please have them forward you their order confirmation and/or PayPal receipt. 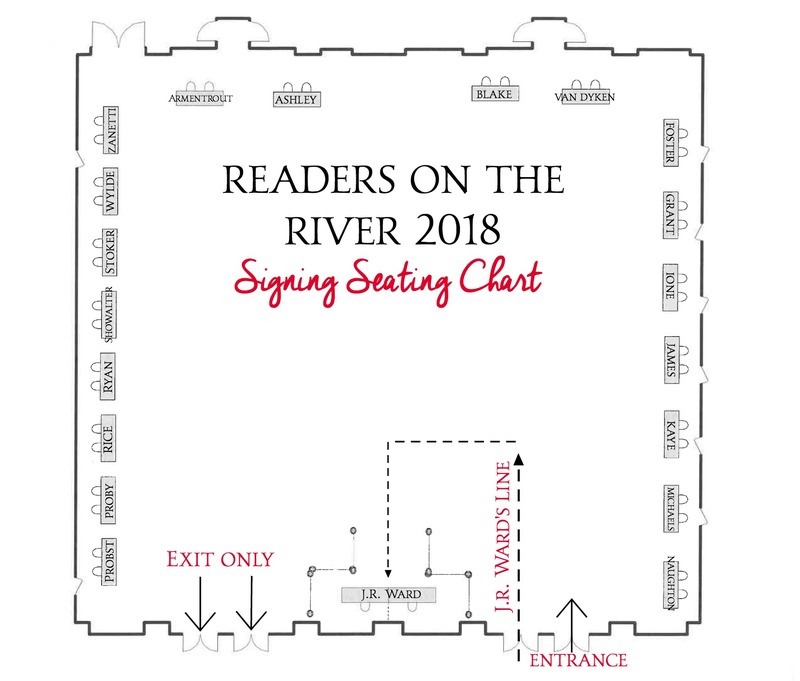 All Readers on the River events are open to ticketed attendees only. All attendees must wear their badges to enter event spaces (with exception of registration and bookstore area). We ask that attendees do not line up for programming (including the Saturday signing) more than one hour ahead of start time. Reminder: Champagne will be served during the 1001 Dark Nights Sparkler on Friday night. There will be a non-alcoholic option for any underaged attendees, or attendees of age who don’t wish to partake. The plated luncheon on Saturday is open seating at any unassigned table (per the seating chart). The only exception applies to attendees who won seats at author tables via our table lottery, and attendees with dietary restrictions (who contacted us prior to 9/15/18). For the Saturday signing: there is a 5 book/item limit per author, per table visit. If you’ve preordered books via an author’s preorder form, your preordered books will not count toward your limit. *Note: This does not apply to web preorders picked up via Barnes & Noble, with exception to CONSUMED by J.R. Ward. We do not have a dress code for any of our events, including the after party Saturday evening (with the 80s cover band). We want attendees to come dressed in whatever they feel comfortable in! If you’re planning to resell/transfer your tickets to a new attendee, you must complete your transfer no later than 11:59PM PST on Sunday, September 23rd. If you have any accessibility concerns, and/or need special assistance while at our event, please email us ASAP at readersontherivers@gmail.com. If possible, please email us before Monday, September 24th so that we have ample time to assist you. * The Readers on the River event team reserves the right to refuse access and/or entry to any attendees who are in violation of event policies. That’s all for now, and we’re excited to see everyone in Louisville!